PARADISE ISLAND - Atlantis, Paradise Island, an Association of Zoos & Aquariums (AZA) accredited facility, achieved a major milestone as the first and only facility in the world to have reproductive success of the smalltooth sawfish, a critically endangered species. Two male and two female pups were born at the facility in The Bahamas on April 12, 2012. The smalltooth sawfish is listed on Appendix 1 of the Convention on International Trade in Endangered Species (CITES) and on the Red List of the International Union for Conservation of Nature (IUCN). Atlantis has displayed smalltooth sawfish for 18 years and has been working on their breeding program for several years. The 4 adults, 3 females and 1 male, were acquired from Andros and Bimini islands in the Bahamas between 1996 and 1999. 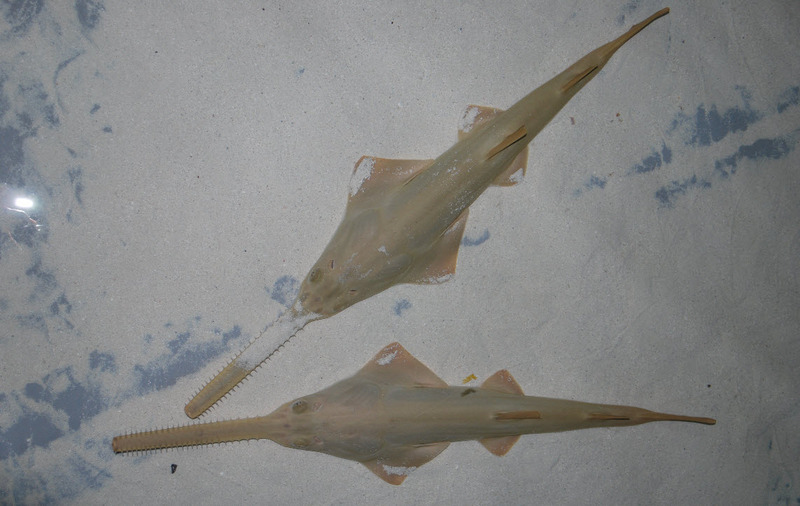 Since 2003, Atlantis has had limited success with sawfish reproduction. However, by systematically tracking and documenting the reproductive activity of the adults, conducting routine examinations, ultrasounds and drawing blood for hormonal studies, the Atlantis Marine team, along with the Veterinarian team, was able to achieve this monumental milestone, a first in the aquarium industry. Collaborative efforts of sharing information and input from other facilities and aquarium professionals, especially Joe Choromanksi of Ripley’s Aquarium, also aided to ensuring reproductive success of this endangered species. There are now 8 smalltooth sawfish in the Atlantis’ marine habitat, half of the world’s zoological population. The adults are exhibited in a large, 1.5 million gallon open-air lagoon that also displays over 10,000 other marine animals. The smalltooth sawfish pups averaged 76 cm in length at birth and have been transferred from the lagoon to the fish hospital. They are separated from the adult population and other animals to be closely monitored by the Aquarium Husbandry staff and Veterinarian team. The smalltooth sawfish is one of the most endangered fish in the world. Little is known about the life history of these fish and even less about their breeding behavior in a captive environment. The wild population of this species has declined dramatically in the United States by nearly 95% since the 1900’s mainly due to habitat destruction and as incidental catch in fishermen’s nets. Sawfish are primarily inshore or near shore marine animals and coastal development has destroyed much of the natural environment where sawfish would typically live. Sawfish are normally found in and around habitats such as mangrove creeks and shallow grass flats, but unfortunately, these areas are usually targeted for land fill and dredging. These practices destroy the natural habitat of the sawfish and are the leading factors in their declining population. In the past, humans caught and killed sawfish for their meat, liver oil, fins and rostra. Atlantis will be sharing its results and will continue to work with other institutions displaying this species in hopes of building a viable, self-sustaining population under human care. About Atlantis, Paradise Island resort, The Bahamas Atlantis, Paradise Island is the flagship resort of Kerzner International, a leading international developer and operator of destination resorts, casinos and luxury hotels. This unique, ocean-themed destination is located on Paradise Island, The Bahamas, and features a variety of accommodations, all built around a 141-acre waterscape comprised of over 20 million gallons of fresh and saltwater lagoons, pools and habitats. Home to the largest open-air marine habitat in the world, there are over 50,000 marine animals in lagoons and displays, including The Dig, a maze of underwater corridors and passageways providing a journey through ancient Atlantis. Atlantis is home to Aquaventure, a non-stop water experience consisting of thrilling water slides, a mile-long river ride with high intensity rapids and wave surges, and never-before-seen special effects. Dolphin Cay, the resort’s interaction and education center, was created with the goal of enlightening visitors about the wonders of these remarkable ocean inhabitants. The Cove Atlantis, a 600-room resort, features oversized rooms with a step down living space, spectacular designs by acclaimed interior architects Jeffrey Beers and David Rockwell, unprecedented services and amenities, private all-adult and family pools, lavish cabanas and breathtaking views of the ocean. Atlantis is also known as THE culinary destination in The Caribbean with a collection of restaurants from world-renowned chefs including Nobu Matsuhisa, Jean-Georges Vongerichten and Bobby Flay. The resort boasts an impressive collection of luxury boutiques and shops, and the largest casino, conference center, meeting and convention facilities in The Caribbean.